New Delhi: On Sunday, about 10,000 elderly people from across the country came together at a Pension Parishad protest organised at Jantar Mantar in the capital demand universal pension rights for the elderly, single women, persons with disabilities, and other poor and vulnerable workers of the unorganised sector. 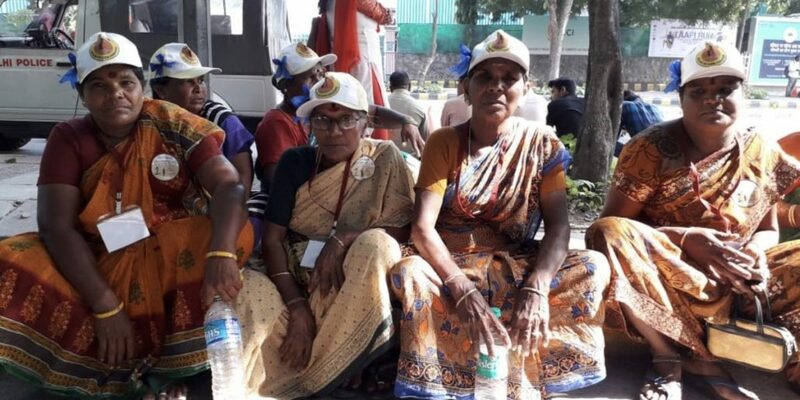 This protest took place just two days after the release of the State of Pension Report, 2018, which had indicated how out of the 80 million elderly entitled to the government pension of Rs 200 per month, the amount was reaching just 22.3 million people. In addition, the report said, the purchasing power of this monthly pension has reduced to a meagre Rs 93. The people gathered at Jantar Mantar were addressed by a number of prominent labour leaders, social activists and experts who expressed complete solidarity with their demand and urged the prime minister and the government to listen to the them in order to keep its four-year-old promise of bringing ‘achhe din’ for the poor. Nikhil Dey and Poornima Chikarmane from Pension Parishad also spoke during the meeting. The Pension Parishad, a network of more than a hundred groups and networks across 20 states in the country fighting for universal pension rights, had pointed out how 94% of the workforce in the unorganised sector pays a substantial part of indirect taxes and contributes to the nation’s economy but remains largely deprived of the retirement guarantees that their organised sector counterparts have. He said they have come to Delhi to talk about the plight of elderly single women who are neither getting rations nor a pension. In some cases, he said, the pension and rations were being distributed intermittently and that too after repeated trips to the ration shop and the concerned officers for pension. Elaborating on the troubles being faced, Sona Devi from Hanumangarh added that “elderly women feel extremely harassed and are demanding that pension amount be raised to Rs 3,000.” She said they also wanted the biometric verification to be done away with for the elderly and that they be provided a minimum of 15 kg ration per persons as against the 5 kg per person at present. Among the women from Rajasthan was also a group of ten women from Jaliya Pitawas village in Ajmer district who spent money from their own savings to come for the meeting. These women, the gathering was told, receive pensions ranging from Rs 500 to Rs 1,500 per month depending on their slab, but found these to be grossly inadequate. One of them, who said she was a nonagenarian, stated that a large part of her pension went into the purchase of essential medicines. And then she asked, “How can 5 kg of wheat be enough especially if they (the old women) are not in a position to work and even if they are ready to work there is not even one functional NREGA initiative in the village where they can earn a dignified living at their age?” She also charged that the elderly women were often shooed away by others younger to them. The meeting was also attended by about 80 women from Kartal district of Punjab who were surprised to learn that women in Haryana were getting a monthly pension of Rs 1,800 whereas in their state, widows with little or no land were only getting Rs 750 in monthly pension and that too in a very “irregular way”. These women said the meagre amount left them with no money to even repair their roofs or undertake any meaningful treatment. In view of the problems narrated by most women, Roy and Mathew Cherian, chief executive officer of HelpAge India, demanded that the monthly pension for the elderly be raised to at least Rs 3,000. He had stated that less than one-third of the elderly in India are covered under the old age social pension schemes. He had also spoken about how less than 8% of the elderly in India were employed in the formal sector and were therefore securing any pension. As for the remaining over 92%, he had stated that as they were employed in the unorganised sector, and they have no social security despite having contributed a great deal to the country’s GDP. Cherian had also spoken about how the real value of the pension released by the Centre has diminished over the years. “The Central government entitlement, of Rs 200 and Rs 500 per month per person for those between 60 years and 79 years of age, and for those above 80 years respectively, declared in 2007 has reduced in purchasing power value to a meagre Rs 93,” he noted. The gathering at Jantar Mantar on Sunday also reminded the Centre that it was its duty to provide adequate pension to the elderly poor so that they may lead a life of dignity. The meeting, which was also addressed by labour leader Baba Adhav, political leader Brinda Karat, social activists Harsh Mander and Kavita Srivastva, and experts N.C. Saxena and Jayati Ghosh, culminated with the demand that there be universal coverage of social security to all elderly. Those at the protest also demanded that the social security pension should be at least half of the minimum wages or at least Rs 3,000 (whichever is more) and indexed to inflation; and that the delivery of pensions should not be linked to Aadhaar. The activists also called for a more “proactive identification of all three categories of pensioners i.e. old age, disability and widow pensions” and stated that the onus of proving eligibility should not be on the person applying. They said anyone falling under the category and complying with the guidelines should be entitled to a pension and insisted that it should not be linked to household income. Calling for setting up of facilitation centres by the government to assist the elderly in filing and tracking pensions, they also demanded that there be “proactive disclosure of pension delivery to beneficiaries” under which the list of beneficiaries, and real time updated information on any changes in the list should be provided both offline and on the website. Finally, they also sought the timely disbursal of pensions – on a monthly basis and on a specific date.